Andrew Ward spent two decades in the Middle East, Central Europe, and South Asia before making his home in South Louisiana. Originally in town for graduate school, he quickly became involved in numerous other projects and events. Through his tenure as an announcer with the Big Easy Roller Girls (www.bigeasyrollergirls.com) he befriended the extraordinary people at NOLA Bulls (www.nolabulls.com) who put on the annual Running of The Bulls and St. Andrew’s Day festivals in New Orleans. After impersonating the pope and blessing the throngs in July 2009, Ward sidled up to the window at an Irish pub in the French Quarter and started giving “Free” advice for $1. Tom Larson, a member of the Krewe of Rolling Elvi popped by and asked him what else he did with his life. Without missing a beat, Pope Andrew declared he wanted to spend the rest of his life singing gospel music and writing children’s books. Tom “Elvis” Larson, an award-winning drummer, University of New Orleans graduate, and Nashville denizen, said he’d like to help. Larson had toured across the country with numerous bands and performed in the Middle East with the USO. He had plans to create a forum for demonstrating the universality of the human experience through musical journeys and was looking for the right jumping off point. The two of them recognized in each other precisely what was needed to realize their dreams. A year passed and nothing happened. In the summer of 2010 Ward received a scholarship from the US Department of State (http://clscholarship.org/) to return to his old stomping grounds in Lucknow, India to brush up on his Urdu. He dove into the study of devotional poetry and Sufi (Islamic mysticism) musical traditions only to emerge stunned at the similarities he found to Southern folk and Gospel ones. He translated a Mahalia Jackson song for several Islamic scholars and they casually remarked that she must clearly be a good Muslim woman with a fantastic voice. This inspired him to translate more songs and see if they would be well-received among the Urdu-speaking population. They were. Andrew returned to the States with renewed energy and called up Tom. In January 2012 the two men met in Nashville and hatched a plan. Tom knew hundreds of musicians and technicians and swiftly put together a band to record “You Are My Sunshine” and a gospel medley at Little Hollywood Studios. There was a tangible buzz in the studio that day. No one had ever done anything like this before. At a time when the US was flying predator drones strikes in Pakistan, protests were erupting constantly, and the level of hatred between the two countries was reaching a fever pitch, this group of musicians in Nashville was recording an album about peace and togetherness. 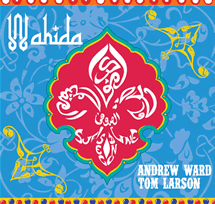 They chose the Arabic and Urdu word “Wahida,” meaning ‘unity’ as the name for their project and launched a Kickstarter campaign (http://www.kickstarter.com/projects/wahida/wahida-the-sufi-second-line/widget) to raise the necessary funds to complete the album. With the help of 80 donors, they were successful. In April, Tom summoned such musical luminaries as the McCrary Sisters, Scott Holt, Jonell Mosser and the Howlin Brothers to lend their unique skills to the project. Tom acted as an exceptionally talented director, coordinator, producer and got the tracks recorded at a breakneck pace. Everyone involved agreed that this was not only an exciting and wholly novel concept; but a profoundly necessary one in view of the mounting hatred in the world. Web designer and album art guru Allen Boudreaux, a New Orleans native coined the term “The Sufi Second Line” and that became the title. In July 2012, where else but at the running of the Bulls, where, three years earlier the pope and Elvis had met and concocted a plan for global joy, the album was released to the public. The result is a melodic journey in three languages, five distinct musical styles, with twenty acclaimed artists. It is a sonic love letter from all that is best about one group of people delivered unto another. Tom and Andrew hope that you enjoy it and live in peace, happiness and with good purpose always. The mission of Wahida is to create and sustain a higher level of respect, interest, and peacefully shared purposes between cultures through the use of musical and lyrical fusions. 1.) To demonstrate the commonalities of all people. 2.) To engender sincere interest in and trust for members of other cultures, religions and ethno-linguistic groups. Drummer and Percussionist Larson was named 2012 Drummer of the Year by the Nashville Jazz and Blues Society. He played in the San Juan Symphony, in Colorado and studied Classical percussion at Fort Lewis College, then transferred to the University of New Orleans and graduated in Jazz Studies Percussion Performance studying under Ellis Marsallis. Tom plays in Nashville in the Scott Holt Band, Lois Berg, The Bullfrog Revue, Delicious Blues Stew, Marion James, Brian Ashley Jones, Patton James, Dave Isaac, Jesse Couch, The Dean Martinis, and many others. Tom also plays around town and the country with various artists from Blues to Jazz, Rock to Zydeco and Country and Americana. Tom is also a session player with many credits to his name. Check out more at www.Tomlarson.com. Tom has been commissioned to produce several scores for theatre productions at the Houston Family Arts Center and had several songs off his solo CDs placed in various films including “The Ugly Duckling”, and “Dangerous Gender”, released in July 2011 and the 2011 48 hour film festival release, Trycho. The product of a youth spent in Yemen, Egypt and Saudi Arabia, Ward’s interests were always international in scope. He studied eastern religions and philosophy at Mary Washington College in Virginia, University of Wisconsin, Madison, and Benares Hindu University in India. While earning his master’s of International Education in Czestochowa, Poland he was moonlighting as a lounge singer and writing children’s stories. In 2004 he moved to New Orleans to pursue his PhD in International development. Along the way he became an announcer, MC, auctioneer, etc. for such widely disparate groups as the Big Easy Roller Girls, NOLA Bulls, the Freret Market, HAMP Fest, Council for American Islamic Relations, and many more. As a co-founder of the 501(c)(3) Voices for International Business and Education, Ward was instrumental in the creation of the International High School of New Orleans (www.ihsnola.org) and remains on the board to this day. A licensed wedding officiant, he performs numerous interfaith, secular, and nontraditional legal ceremonies regularly. For his civic efforts and contribution to the city in 2011 he was named one of Gambit Weekly’s 40 Under 40 (http://www.bestofneworleans.com/gambit/gambits-40-under-40/Content?oid=1902308) after having been recognized by the Times Picayune as one of New Orleans’s Young urban Rebuilding Professionals. (http://blog.nola.com/times-picayune/2007/08/no_has_become_a_beacon_for_you.html). He lives in the Bywater and moonlights as a tour guide of the French Quarter. He still enjoys writing children’s stories.